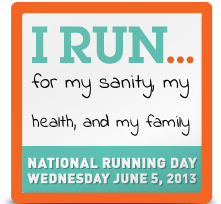 Have you claimed your National Running Day badge? I do enjoy a national day dedicated to a sport that I love. I really do, but it does seem a little silly to dedicate only one day to running - because to me, everyday is a running day. Well, except for me, right now. I on the other hand will not be running today. I'm injured. Boo! I'm not sure what's going on, but I do know the area just below my knee, to the inside hurts. At random times, I'll get a sharp, shooting pain, but most of the time, it's just sore to touch and achy. 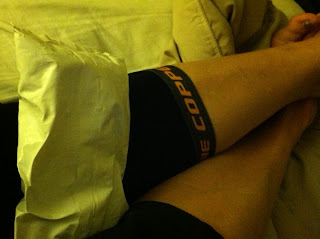 I'm resting right now, wearing Ward's Tommie Copper knee sleeve, icing, and stretching. I want to run. I want to run so badly. I'm 8 weeks away from the GCI 50K and I want so badly to do this race, especially since it's the last year this race will take place. Fingers crossed this isn't major. Depending on how I feel, I'll try to go out for short run tomorrow and I have a chiropractic appointment on Friday. Rather than be a downer about not being able to run on National Running Day - I'm going to reward one of my readers with a great new running accessory! I was sent two headbands from 6 Dollar Bands - one for me to try out and one for me to giveaway to one of you! The purple one above is the one that is being offered in the giveaway. I promise I did not wear it! Not even once. I snapped a picture of it and put it away so Izzy wouldn't get it either! As I said, I was sent two pairs. I chose to try out the pink double band. I've never seen a double banded headband before, so I was quite happy to try this one out. I do love sparkly headbands too! What I enjoyed about this one was that 6dollarbands are adjustable and they did not slip at all. Each of their headbands are lined with velvet and are quite affordable. As the name of the store suggests, most of the bands are $6, but they do have a selection of $8 bands as well. A woman can never have too many headbands, especially if you have a daughter who likes to take them! Needless to say, I love this headband. And I received tons of compliments wearing it as well! Now, the great part - how do you get your chance to win that purple beauty above? You'll have 3 possible ways to enter and you'll need to comment below for each separate action. - Leave me a comment telling me why you run. - Follow me on twitter and 6dollarbands and tweet "Happy National Running Day! 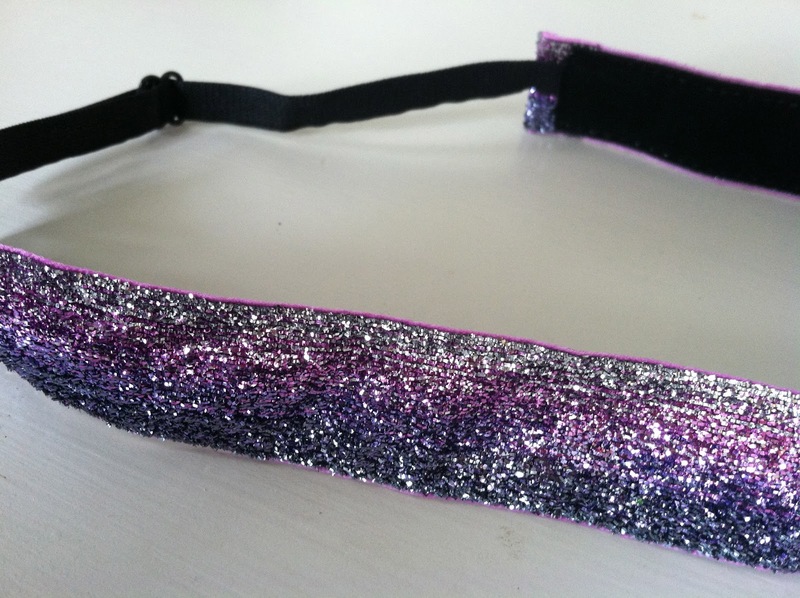 I want to win a new headband from @6dollarbands & @runningwtg http://www.runningwiththegirls.com/2013/06/happy-running-day-giveaway-too.html" & leave me a comment with the link. - Visit 6dollarbands store and tell me which print you would love if you bought one! The giveaway will end Saturday 6/8/13. I will announce the winner on Sunday 6/9/13. Disclaimer: I was provided 2 headbands at no cost. 1 headband was intended for a review and the other for a giveaway. I was not required to provide a positive review. As always, all opinions expressed on my blog are 100% my own. I run so I can feel less guilty for eating what I want :) and because its an easy form of exercise that I feel so accomplished doing. I love the adrenaline rush that comes with running races. I run to stay healthy, I run so I can drink, I run to keep my mind and body strong. I would get either the softball for my daughter or sparkle black for me. Love th color wave in red/black band! I would get sparkle ombre blue! I run so I can eat! But also to accomplish goals and have some sanity in my busy life! Running=Happiness and cheap therapy for me. Also a way to keep healthy and an outlet. I run to stay healthy and happy!!! Running motivates me throughout my day to day life. I run because it makes me better physically and mentally. I think I'd buy the one you're giving away: ombre purple. Love it! I run for my sanity and to reach a lot of goals I have set! I totally like the red & black wave. I run to so I can eat whatever I want! I love the "Who Do You Race For" pattern! Pretty cute! I love the Pinwheel Blue! I run because it allows me some quiet time to myself, and also has wonderful meeting new friends~! Oh my gosh! I LOVE the glittery headbands. I run because it is a "positive and healthy addiction." I have a horrible family history of alcoholism and other issues and running does an amazing job keeping me clear of that and focused on making healthy choices in life. And...running, and runners in general, is/are just downright awesome! Oh no!!! I hope your injury heals quickly!! I know how much you want to do GCI especially since it is that last year. I run because I love being out in nature.